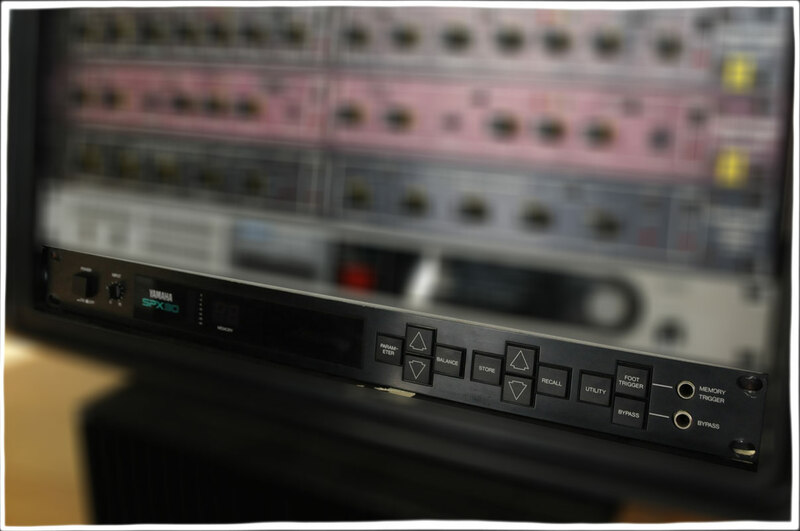 The Yamaha SPX90 is one of the classic multi-fx units, used in professional studios worldwide for many years. They can be used for reverb, vibrato, delay, chorus, flange, gating, compression, drum room & gated reverb fx, parametric eq, rotary fx and much more. Presets can be stored in memory, and recalled via MIDI or footswitch. Reverb : The SPX90 precisely recreates the reverberation produced in a variety of environments adding natural, live fullness to your sound. Early Reflections : Early reflections programs simulate the first few reflections that occur just after a sound is produced – before the reflections become dense enough to be called reverberation – adding punch and presence to vocals and instruments. Delay : Delay effects offer independently variable left and right channel delays adding special interest to a common effect and permitting the creation of “doubled” sound. Modulation : Modulation effects are produced by periodically varying the amplitude, frequency, or delay time of an input signal. Popular effects like Stereo Flange, Chorus, Stereo Phasing, Tremolo, and Symphonic are all available and can dramatically thicken the sound of any instrument. Auto Pan : This program automatically pans the second image between left and right in the stereo sound field. Pan direction, speed, and depth can be programmed for instant recall. Vibrato : The Vibrato effect produces minute pitch variations that are adjustable over a wide range. This can give your keyboard, guitar, or wind instrument a distinct “vocal” quality. Echo : Similar to delay, Echo brings added dimension and force to both instrumental and vocal music, producing limitless signal variations. Pitch Change : Pitch Change programs alter the pitch of an input signal in semitone increments over a two-octave range (plus or minus one octave). Fine adjustment in one-cent increments is also possible (one cent = 1/100 of a semitone) Pitch change permits detuning an instrument to create subtle chorus-like effects and to create complete ensembles with a single instrument. This feature can be remotely controlled by a MIDI keyboard or sequencer. Freeze : These are sampling programs which permit recording a sound segment in the memory. The entire sound or specific portion of it may then be played back as required. The FREEZE B program even permits changing the pitch of the sampled sound from a MIDI keyboard, so you can actually play the sample as if it were a keyboard voice. Playback can be triggered from the front panel, via a footswitch, or input signal. Compressor : Compression limits the dynamic range of an input signal, boosting soft signals and reducing high signals to keep them within the specified range. This feature provides an effective way to smooth out the dynamics of a bass guitar, increase the sustain of a guitar, or tame a “jumpy” vocal performance. ADR-Noise Gate : This program uses a gate circuit to pass or shut off a short segment of a longer input signal, or it can be used to pass only signals that exceed a specific level. Reverse gate effects can be achieved in which the gain increases gradually after the gate is triggered. In addition to signal-level triggering, it is also possible to trigger the gate via a footswitch connected to the front-panel MEMORY/TRIGGER jack. Parametric EQ : This program enables you to precisely adjust the frequency response of a ny signal in four distinct bands: a variable low-pass filter; middle band peaking EQ with frequency, gain and Q control; high band peaking EQ with frequency, gain and Q control; and a variable high-pass filter. This equalizer offers exacting control that lets you achieve virtually any response you need. Input Level Control : The input level can be regulated while watching the INPUT LEVEL meter. The 7-segment LED meter keeps you informed of optimum level and potential overload distortion. In this way, you can balance the output of the instrument to the input. A maximum gain of about 10dB is attainable. Input Level Meter : This easy-to-read LED level meter is a visual aid to setting appropriate input levels. The LED’s upper red segments will light up continuously at overload levels. Parametric Key : Selects successive effect parameters. Pressing this key sequentially calls the programmable parameters within a currently selected effect program. Onec the desired parameter has been selected the PARAMETER INCREMENT/DECREMENT keys are used to change the value of that parameter thereby modifying the effect. Memory Number LED : This LED display shows the number of the currently selected program. Memory numbers 1 through 30 contain factory-preset effects. Memory numbers 31 through 90 can be used to store edited versions of the preset effects. LCD Program and Parameter Indicator : High-contrast Liquid Crystal Display indicates effect name and parameter data value. Remote Control Connector : This permits remote access to SPX90 effect programs. MIDI In Terminal : This permits SPX90 programs to be automatically selected via a MIDI signal. MIDI Thru Terminal : Re-transmits MIDI data received at the MIDI IN terminal to subsequent MIDI instruments. Parameter Increment/Decrement Keys : These keys can be used to change the value of a selected parameter. Balance/Output Level Key : This adjusts proportion of effect signal to direct signal. Utility Key : Multi-purpose key accesses MIDI control functions, facilities progrma title editing and sets foot switch memory control range. Foot Trigger Key : When this key is pressed and its LED is ON, the footswitch connected to the MEMORY TRIGGER jack functions as a foot trigger for the GATE and FREEZE programs, rather than for memory selection. Memory Increment/Decrement Keys : These keys select any desired memory number to call a specific program or store an edited program in the user memory area. The selected memory number is shown on the MEMORY NUMBER display. When a new memory number is called, the MEMORY number display will flash until either the STORE or RECALL function is activated. Recall Key : This feature enables you to recall the program that resides in the selected memory number. Bypass Key : When this key is pressed, the effect signal is shut off and only the direct signal will be output, Direct signal level is affected by the INPUT LEVEL control setting. Output Jack (L & R) : These standard mono 1/4″ phone jacks deliver the direct and effect signals to subsequent mixing or amplification equipment. Input Jacks : This standard unbalanced mono 1/4″ phone jack accepts the input signal to the SPX90. Bypass Footswitch Jack : Facilitates foot control of the BYPASS function. Memory/Trigger Footswitch Jack : Facilitates remote memory selection via optional footswitch. The range of memory locations to be recalled by the footswitch can be set with a Utility program.